Sir Joseph Banks High School and Whalan Public School both consistently demonstrate high levels of advocacy at school, as reported by their students in our Tell Them From Me surveys. In our latest podcast, CESE sits down with Murray Kitteringham and Melanie Check from Sir Joseph Banks HS, and Helen Polios from Whalan PS. Murray and Melanie discuss how school equity funding is used to respond to student needs. The school uses data in a positive way to shift perceptions and share student successes with the school community. Helen discusses how Whalan PS has a consultative and inclusive relationship with families. By spending time listening to students, parents and staff, they have built strong relationships with the community. Hear these and many more strategies used by the schools in the Supporting students' learning podcast. Resources for schools, teachers and parents. The Learning Curve investigates what the Tell Them From Me data tells us about advocacy and support. The Resources publication demonstrates this at a local level, with in-depth case studies from Sir Joseph Banks HS and Whalan PS. Read the Supporting Students' Learning publications. The evaluation of LSLD began in mid-2016 and will conclude in mid-2019. • collaborative approaches to school planning. Attendance rates were generally high for primary students. The average rate was 93.9 per cent in 2017. Across years of schooling, attendance rates decreased at a much slower rate in primary years (drop of 1 percentage point between Kindergarten and Year 6), than in secondary years (drop of 5 percentage points from Year 7 to Year 10). There remains a sizable gap of 7.1 percentage points in average attendance rates between schools in major metropolitan cities and those in remote / very remote areas. The gap between Aboriginal and non-Aboriginal students’ attendance rates has decreased from 7.1 percentage points in 2011 to 6.4 percentage points in 2017. Aboriginal students’ attendance rate at remote/very remote schools increased 4.3 percentage points since 2006. 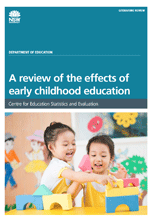 CESE's latest literature review presents Australian and international evidence on early childhood education and its impacts on children's learning and development. • the positive effects of early childhood education programs are contingent upon, and proportionate to, their quality. CESE's latest statistical bulletin identifies the diversity of students with a language background other than English who were enrolled in NSW government schools in 2017. • About one third (34%) of students in NSW government schools come from homes where languages other than English are spoken. • The concentration of students with a Language Background Other Than English (LBOTE) is greater in the Sydney metropolitan area. • Across all Sydney schools, the proportion of LBOTE students is 53%. The highest proportion of LBOTE students is in Sydney-West. • The Indian languages category is now the largest language group, representing 17% of total LBOTE students. This is before Chinese languages (16%) and Arabic (14%). Language participation in NSW secondary schools has been in decline since the 1960s.  Only around 10% of students in NSW now take a language for the Higher School Certificate (HSC). The decline in student numbers is particularly noticeable from the beginning of the middle years of secondary high school onwards. 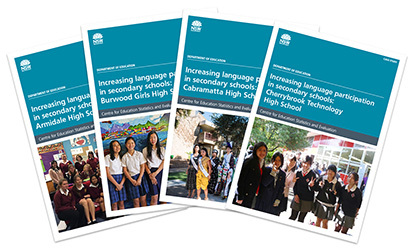 CESE's Language participation in NSW secondary schools literature review provides a brief overview of languages education in Australia and NSW, including participation rates and national and state policy. Accompanying the literature review are 4 secondary school case studies. Each case study explores the practices that contribute to success in language participation at each school. Cognitive load theory is a theory of how the human brain learns and stores knowledge. It was recently described by British educationalist Dylan Wiliam as 'the single most important thing for teachers to know'. Grounded in a robust evidence base, cognitive load theory provides theoretical and empirical support for explicit models of instruction. • recommendations for the classroom based on the cognitive load evidence base.